I saw the movie, “Lion,” before I bought the book. Usually I like to read a book first before seeing the movie, but in this case I’m glad I did. The movie is so verbatim of the memoir I felt like I was just reading the movie via words vs visually through a movie. 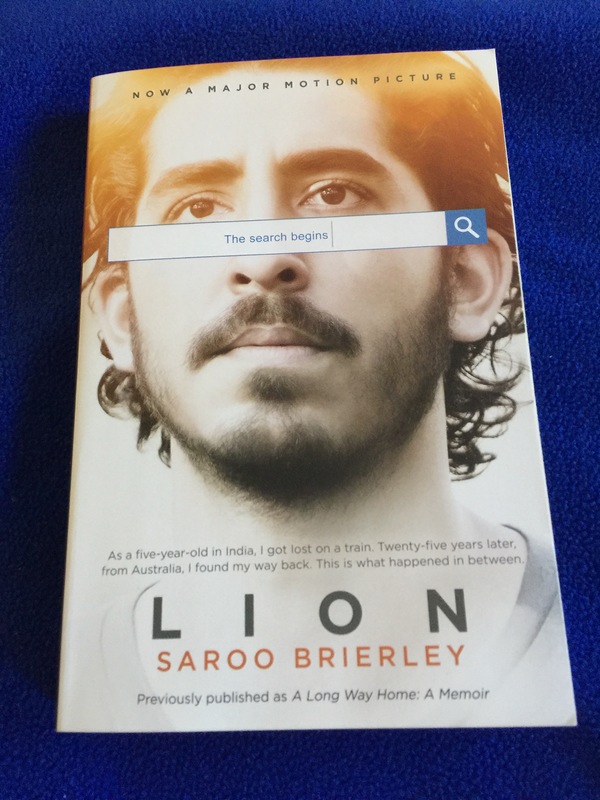 This is the memoir of Saroo from India getting lost and separated from his brother Guddu at five years old. He begs to go out and help his brother gather what food they can find for their family. Being little Saroo is sleepy with it being late at night so he rests on a train station bench. Guddu tells him to stay put and he’ll be right back, but when Saroo wakes up his brother is nowhere to be found. He looks around the station and even in some of the trains. Thinking his brother will find him inside one, Saroo lays down for more sleep. The next thing he knows is that waking up the train is in motion and he’s stuck on the train. Saroo winds up far from home with a limited vocabulary of how to express where his home is and who his family is. A few people try to help him with no success locating his family, so he winds up in a scary orphanage. Thankfully a nice Australian couple want to adopt him, so Saroo gets to fly for the first time. His new parents are loving and patient. Saroo even gains a brother, another adoptee from India. Saroo keeps his memories of home in the back of his mind, to never forget them. He loves and thrives in his new home, country and family. After college he decides he wants to find his family. How to find it with the minimal information he remembers as a little five-year old? Welcome the lovely technology of Google Earth. This memoir is beautifully written. It tugs at your heart, your sense of what makes up a family and how memories can bring miracles. Go see the movie first though. You won’t regret it.